Ever since the WWE announced that Hall of Famer Terry Bollea, better known as Hulk Hogan, was being re-instated into the Hall of Fame and welcomed back to the company, fans have been wondering when the Hulkster would make his TV comeback and in what capacity would he fill. Despite being the biggest babyface of the 1980's era of wrestling, Hogan is more memorable to the younger audience for his heel runs in the NWO in both the WCW and the WWE. Hogan had been removed from the WWE Hall of Fame in 2015 after a leaked recording of the superstar had him complaining about the race of his daughter's boyfriend and repeated use of the N-word in the recording. The tape was released in the midst of Hogan's heavily publicized libel case against infamous gossip website Gawker. In the subsequent weeks after Hogan's reinstatement, Hogan has posted short personal clips on his twitter account that is frequently interrupted by static noise, distorted images and then a few bars of the famous NWO entrance music. 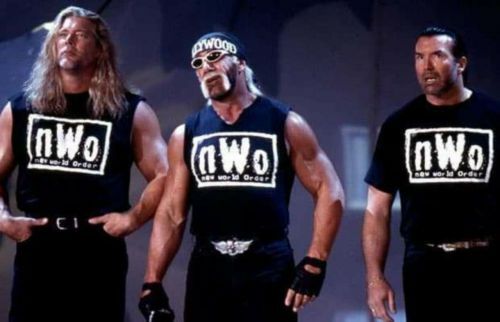 Coupled with the rumors that Hogan, alongside NWO stablemates Scott Hall and Kevin Nash, were seen filming something at Hogan's Florida Beach Shop. Many fans would be clamoring for the nostalgia pop that would accompany a Hogan, Hall and Nash reunion on TV at a WWE event, even the most ardent of those fans will hope that this doesn't lead to anything serious in the ring. The filming, however, seems to suggest that the WWE may be filming the trio for some sort of WWE network special on the stable, or potentially an episode of Table for 3 to be aired on the network on a later date. 10 of WCW's dirtiest scandals.